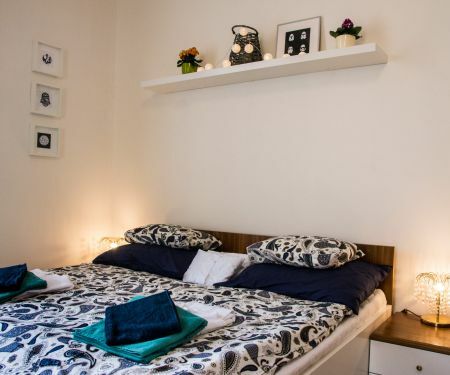 Apartment of 46,5 square meters in a apartment house decorated in bright colors, is located in Černá Pole district, just a short distance from the center of Brno. In neighborhood there is a children's hospital built in 1898, but also the complex of agricultural Mendel University. Quiet neighborhood of Černá Pole will provide you all the services. Just around the corner are two parks - Stanislav Krátký´s park and Marie Restituta´s park, where you can spend a free afternoon. There are also several playgrounds, post office, supermarkets, restaurants and a pharmacy. Villa Tugendhat, which belongs to the UNESCO world heritage or Mendel University Arboretum, is definitely worth visiting. Just two hundred meters from the house is the Merhautova trolley bus stop or Venhudova tram stop, from which you can reach the city center within ten minutes. The apartment for two is furnished in modern style. The unusual kitchenette, which is equipped with everything you need for cooking, will catch your eye for sure. While preparing a delicious dinner, guests can watch you from behind the bar counter. The living room, which has a large sofa and LED TV, is connected with the kitchenette. 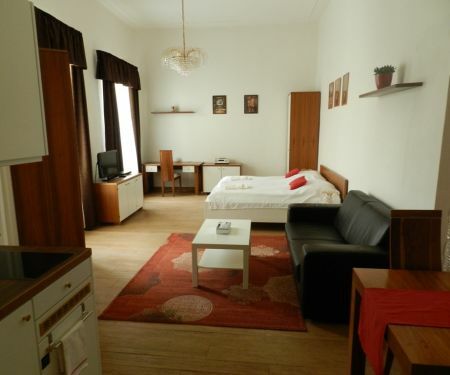 Bedroom provides enough calmness for nice sleep and cabinets enough space for all your stuff that you bring to Brno. What´s more, there is also a balcony facing the inner garden, which is also available for you. The bathroom with a glass shower, toilet and washing machine is decorated in calm colors. Convince yourself with our 3D virtual tour.